Zorki 1 History and the Russian "Operation PaperClip". A few Zorki 1 "F" shots. The weird stuff of the E and F series. Zorki 1 History and the Russian "Operation PaperClip"
The Zorki 1 Series. 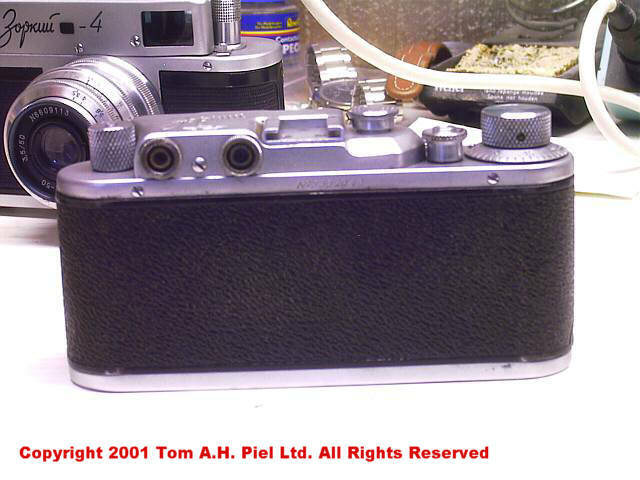 This is a True Leica II copy. 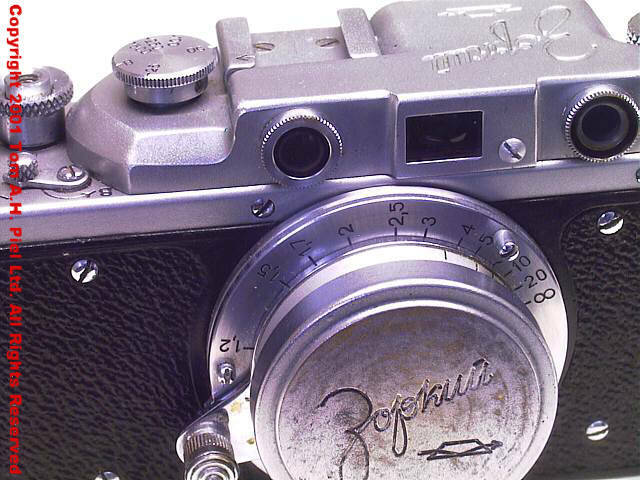 Allthough all the Zorki 1 cameras look alike, there are differences. We see six different series. The A, B, C, D, E and F versions. And even they have Subversions. There is a very rare Zorki 1(a) with slow speeds. But there are more. I will not go in to the fake leica's made from Zorki's. They exist and can be beautifull too, but I can only write about what I have myself. In total 835.000 Zorki 1's were built from 1949 until 1956. Princelle only mentions 5 different series. But many collectors speak of a F version (some even go up to a G version. So for the sake of argument I will maintain it here also. 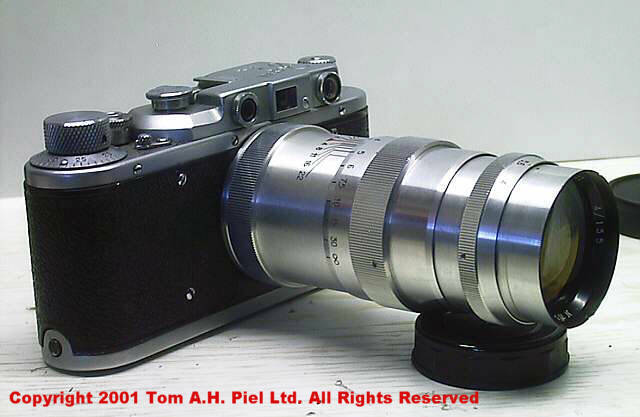 Why call it the True Leica II copy? 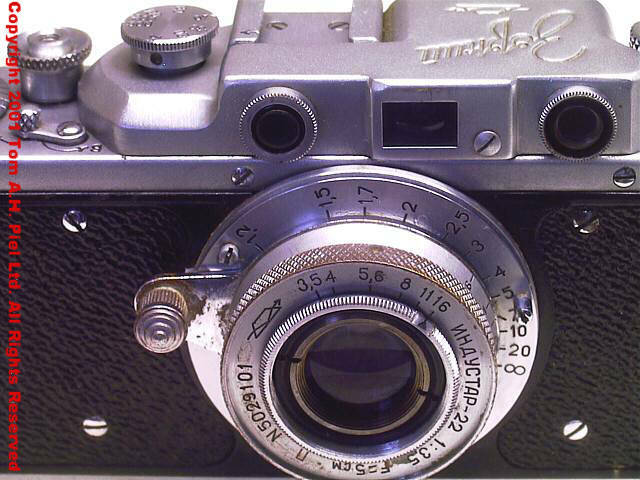 At the end of the Second World War (read The Great Patriottic War) the Russians did not just raid the Leica and Zeis factories. No... They literally took them with them back to Russia. Including some of the Scientists, it was the Russian equivalent to the American Operation Paperclip. 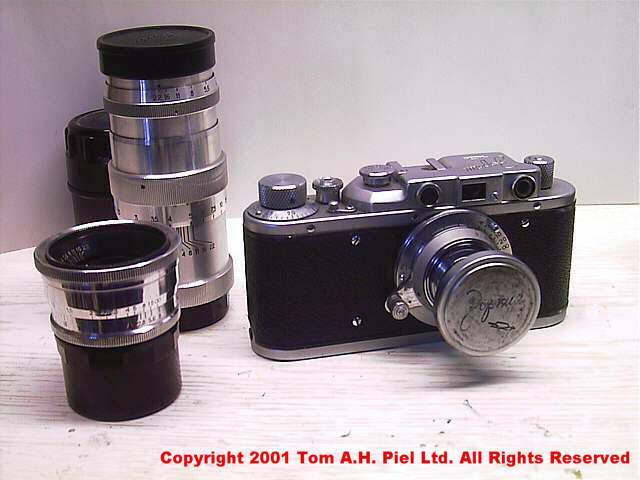 Just about all of the FED's and Zorki's are based on Leica. The first FED's were made in 1932/1934 and were copies. But like all of these they are remarkable copies. 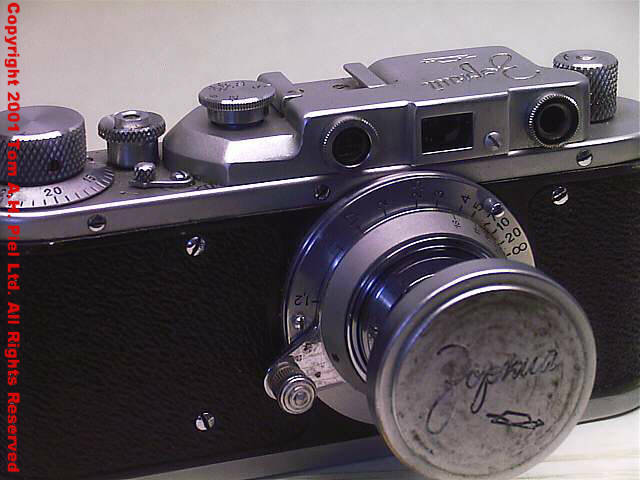 The USSR has produced more "Leicas" than Leica itself. The quality of the Zorki's is the remarkable part. I have 2, both are from 1955. And both work. No stripes in the negative. Clear lens. I didn't even had to adjust the viewfinder. I just cleaned them and added new grease to the lens. Zorki means "Sharp Look" or rather "Sharp Sight" (in Dutch "Scherpe Blik" and in French "Regard Percant"). 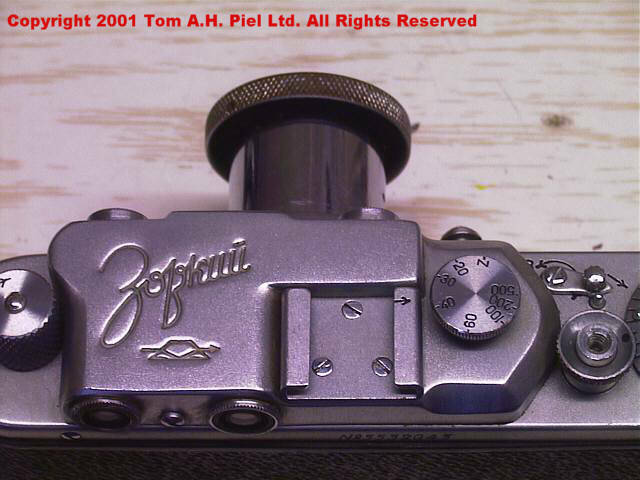 These are Shots of a Zorki 1 F or E, the last productiontype. According to Princelle this E version was in production from 1954 until 1956 and 240.000 were built. 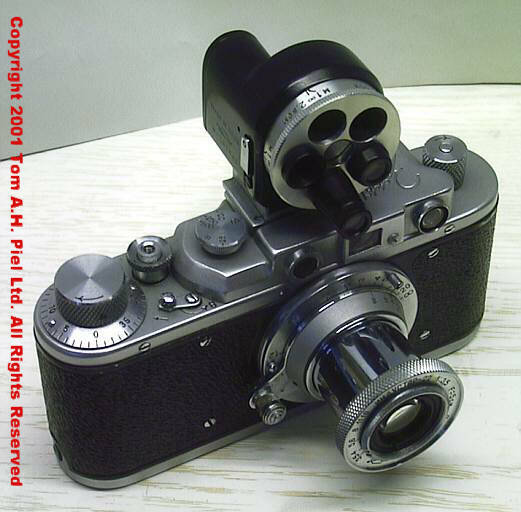 In some photos it's equipped with a Turret Finder (also known as the Universal Rangefinder). A rare but very usefull piece of equipment. 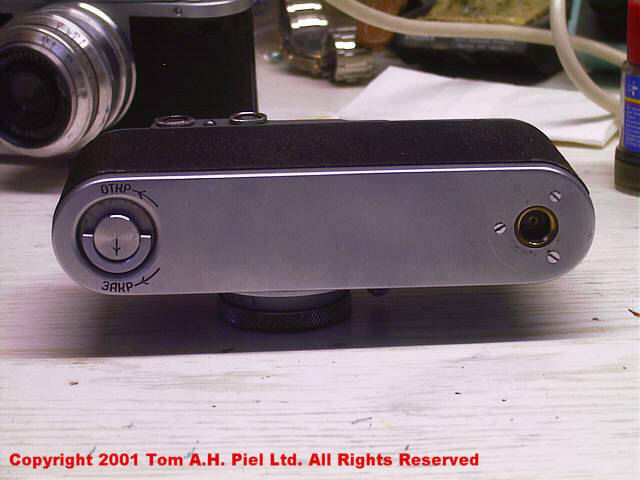 The Turretfinder shows the "correct" view for the lens you are using, it has five minilenses for this purpose. It has a 28, 35, 50, 80 and 135 mm minilenses. You just turn the Turret to get the correct minilens to see what your lens does. But now for something interesting. I found a Zorki 1 at a fleamarket in Holland. It came with the Ever ready brown leather case (2 snaps on the back). 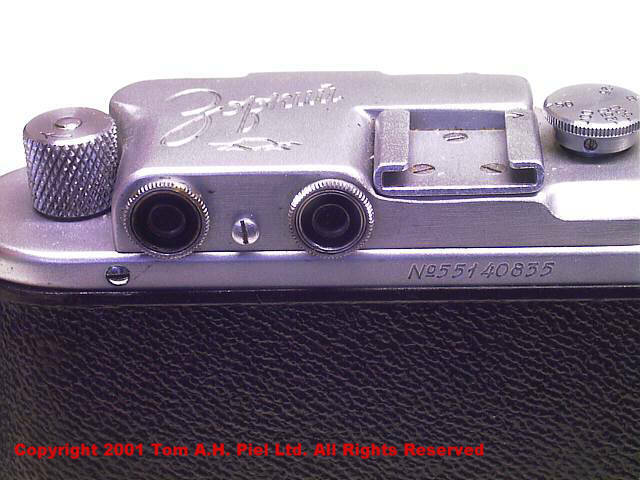 The serial number was 5532043 so it must have been built in 1955 so I thought it would be a Zorki 1 F. But it has different shutterspeeds (which all work). It has Z, 20, 30, 40, 60, 100, 200 and 500. 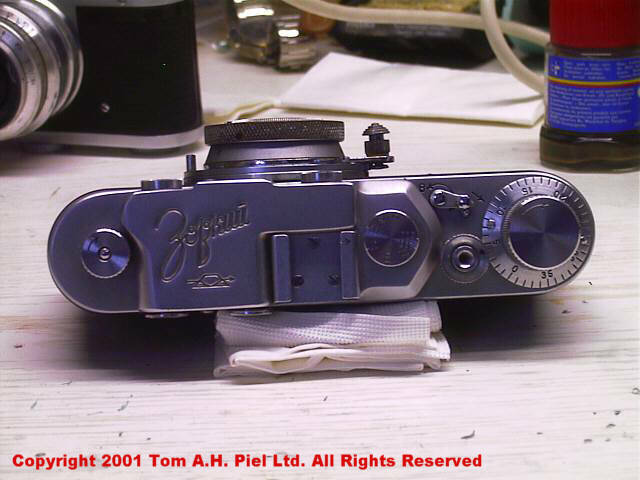 My other Zorki 1 which is an f has B, 25, 50, 100, 200 and 500. These speeds identify it as a E and it has the same decorative rim around the lensmount. But it has a F topplate. The Zorki logo is in Cyrillic and is clearly stamped in the metal, the KMZ logo is beneath the Zorki logo. 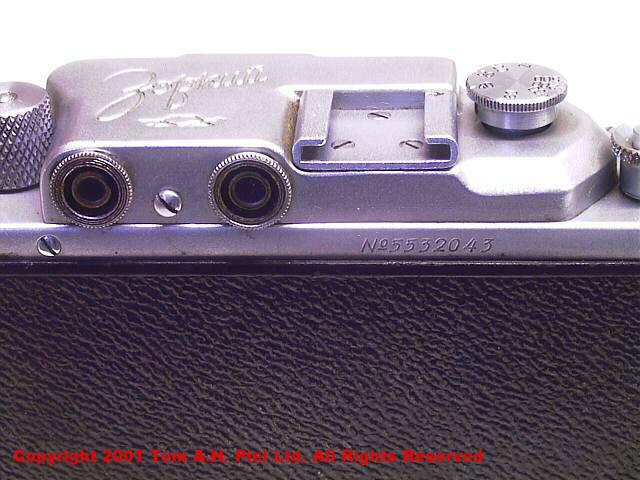 Exactly like my Zorki 1 F.
Zorki 1 ? Closeup shots of the Topplate, the back and the front. Zorki 1 F Closeup shots of the Topplate, the back and the front. As I see it there are several possibilities. Let's play them out. 1. Production Overlap. Parts from the last serie (the E) were used to produce the F. This then happened to at least the first 32.043 of the series. In a way this makes sense because production of the Zorki 1 was at its peak in 1955 (204.000 made) and then dropped sharply in 1956 (only 34.377 made). This is the most likely explanation. 2. 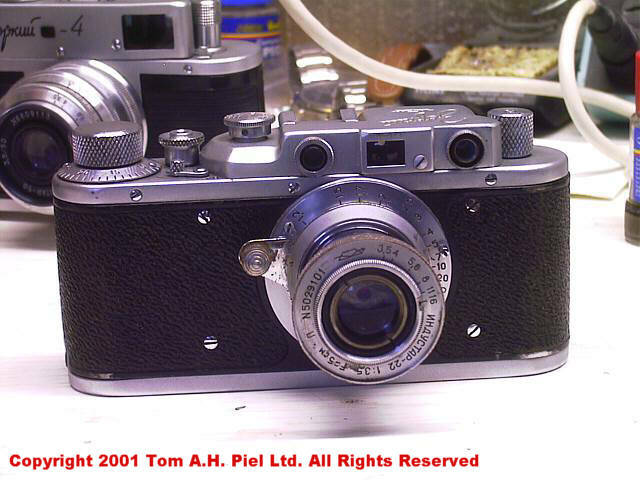 It's a camera built from two separate cameras, a repair pherhaps. Could be, but then it was done very well, there are no scratches or other marks of any kind that could indicate a repair (usually you can notice this at the screws). On the other hand it might be factory repaired. Then again there are several more cameras with these specs. I noticed that when I was posting in the cameraforums. 3. 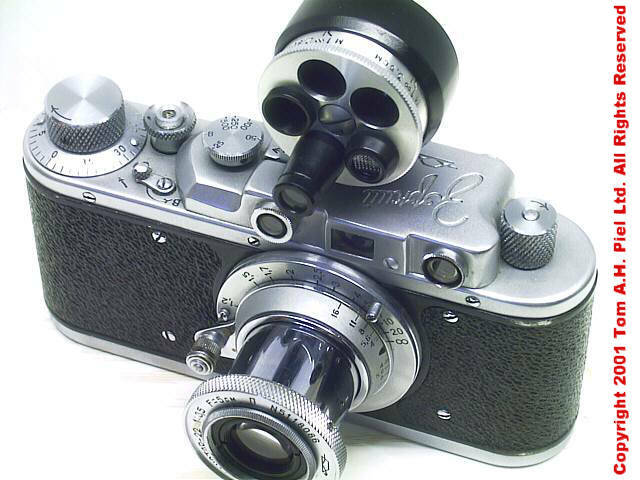 There were 2 versions of the F one made with 8 speeds. And one version with only 6 speeds. 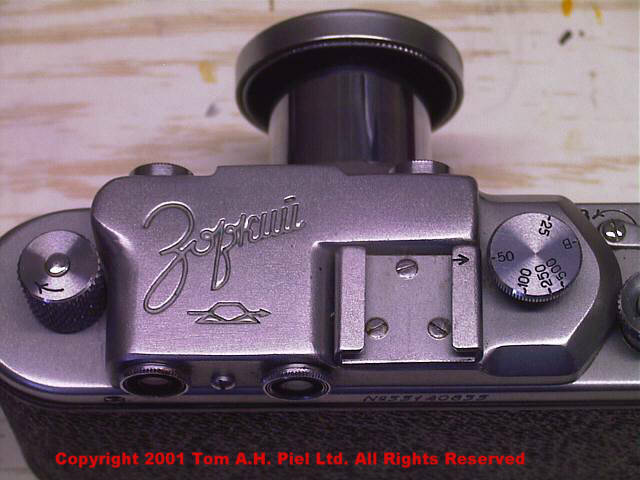 Until the F version came around all Zorki 1's had Z marked on the speeddail, why did they it change to B? Pherhaps an exportversion? 4. Princelle got his dates mixed up. Besides that Princelle doesn't even mention the existence of the F. Princelle says that it's an E version. But then the topplates and dates would not match. That would mean that the D and E versions overlapped and that there were more subversions of the D than we knew. So this could be a D made in 1955 with a redesigned topplate. My F would be an E version made also in late 1955. This means the D version was made from 1953 until the beginning of 1955. The E version was made from 1955 until 1956. This would put all my data in accordance with Princelle's data. This also would be a production overlap, so it seems logical. 5. The Conspiracy Theory. Someone has made this camera to confuse us all. Peronally I think that the Russians never made a F series. I think there were 2 versions of the E series, one made with 8 speeds, and one version with only 6 speeds. Princelle mentions the E to have only six speeds and says that these are the new standard speeds. So my guess is that there was an Export version. Example until the E version came around all Zorki 1's had Z marked on the speeddail, so why did they it change to B? Unique or Not ? I don't know, it's probably not unique. Then again I don't expect it to be unique, I expect it to do what it was ment to do. Taking photographs. To me it's a really nice and good camera. And it handles like a dream. I'll cut a film for it as soon as I can to test it. If it performs like my other Zorki 1 then I'm happy.